351 Desk Finish: White Features: -The Norma Jean will accommodate large and heavier sewing machines that do not exceed 12" front to back, 22.75" right to left, and 13.12" tall.. -Durable MDF and furniture grade pressed wood with vinyl laminate. Style: -Contemporary. Top Finish: -White. Base Material: -Manufactured wood. Top Material: -Manufactured Wood. Hardware Material: -Steel. Weight Capacity: -50 Pounds. Dimensions: Overall Height - Top to Bottom: -30.5". Overall Width - Side to Side: -81.5". Overall Depth - Front to Back: -19.75". Overall Product Weight: -103 lbs. -Knee hole: 26" W. -Platform: 23" W x 12.25" D.
Air Lift Mechanism: The Arrow Norma Jean table has an easy to use airlift mechanism that raises and lowers your sewing machine with just a simple push. You can position the base of your machine flush with the table top in freearm position, or you can push it down slightly into flatbed position so that that the sewing bed is flush with the surface. The mechanism easily adjusts to accommodate any sewing machine base height, so you can be sure your fabric will be perfectly level. Large Surface Area With Compartments: When the leaves are in the open position, the table top features a vast expanse of surface area to either side of your chair. (The leaves rest on sturdy supports, so you don't need to fear that they will bow and crack the second you put anything heavier than a spool of thread on top.) The opened leaves reveal not only functional surface area, but also recessed compartments for keeping tools and materials handy. Storage: When the main door is opened, it not only creates space for your chair, but allows you to enjoy easy access to four accessory trays attached to the inside of the door. The trays are perfect for holding thread and other small notions. 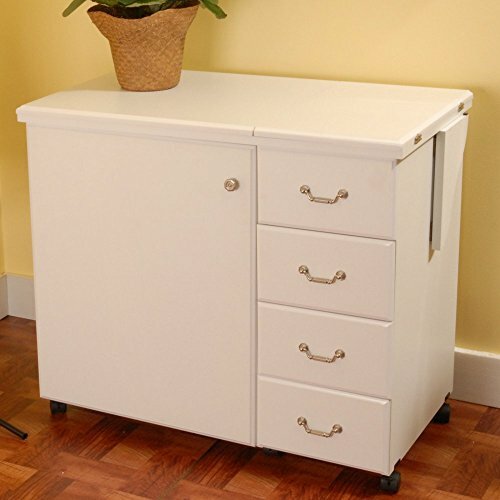 Four large drawers provide even more storage. Having a place for all your materials makes getting organized a snap, and your sewing experience becomes much more pleasurable. Flexibility: When you're done using your machine, simply push down to lower it all the way into the cabinet . Then, fold up the leaves, close the door, and voila: You've got a small, tidy cabinet that conceals your machine and supplies. It can also easily roll out of the way until you need it next. Styling and Finishes: The Norma Jean features beautiful, classic styling with furniture edges and elegant knobs and drop-handle pulls. It comes in classic oak with polished brass hardware, crisp white with brushed nickel hardware, or an elegant cherry finish with polished brass hardware. If you have any questions about this product by Arrow Sewing Cabinets, contact us by completing and submitting the form below. If you are looking for a specif part number, please include it with your message.